Have you ever envied someone when they tell you they were able to negotiate a great deal? It may have been for a large item, such as a car or a house, or something smaller such as a holiday or a washing machine. It is almost always appropriate to haggle and nothing to be ashamed of. You are just asking a simple question. You wouldn't dream of paying the asking price for a house or a car. You'd put in an offer and take it from there - you'd haggle the price. So it's no different to your other big ticket shopping. You can haggle at markets, in department stores, jewellers, your mechanic, just about anywhere you shop. Wayne and I haggled a couple of weeks ago when we were ordering some work to be done on our new toy. I guess I should explain about the "toy". Earlier this year, after his heart attack, we had a long, long look at our lifestyle and made the decision to just slow down. Not stop working, not stop living, but just slow down. It was never our intention to go flat chat all day everyday, we had just fallen into the rut and couldn't see out of it to realise how much our lives had changed. So we have slowed right down. I think I mentioned earlier this year that we would be making some changes and we have. One of them was not working 7 days a week, something we were both guilty of, and it wasn't out of necessity, it was out of habit. We both like to be busy and active and working seemed a good way to be both. Unfortunately even though we both really love what we do, it is stressful, especially when you throw in teenage kids, aging parents and all the other things life throws at you. I can tell you it wasn't easy. Trying to think of things to do, that we would both enjoy (because I just do not like model trains and he just does not get my interest in tapestry) had me scratching my head. Then, in one of those "DOH" moments, it hit me: four wheel driving! 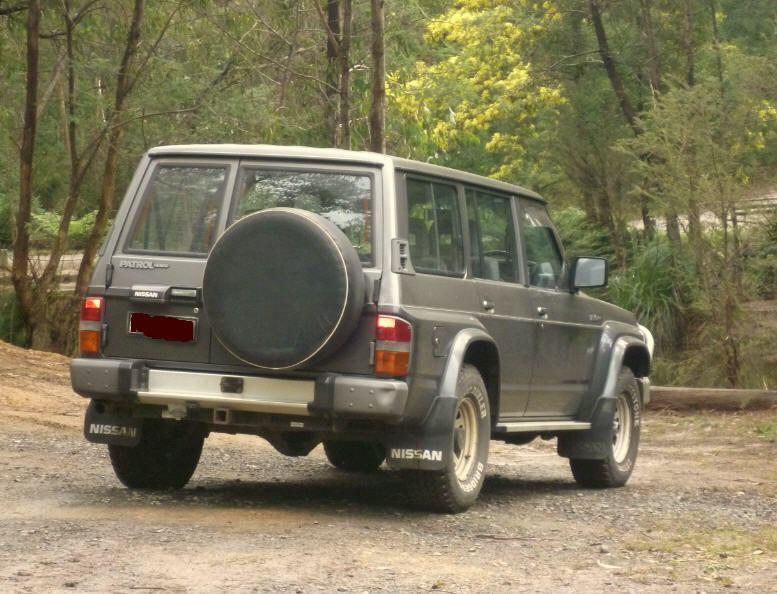 It was something we had done and really enjoyed up until just before AJ was born, when we sold our beloved Hilux and bought a sedate family car. Honestly if the authorities had allowed capsules in the back of the ute and I'd been able to climb into it and reach the pedals with my huge pregnant belly that car would still be in our garage! Anyway it went and we gave up camping and off-roading to raise our children. And we don't regret it. 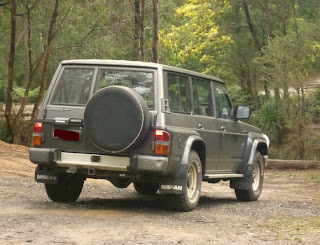 But now we have a lovely "new" toy to play with, a 1991 GQ Patrol and we love it. But it is, or rather was, stock standard when we bought it so of course we've had to do some modifications. Which brings me back to the beginning of this epic tale, which should be about haggling and not our new hobby. So we were in the store, getting quotes for the new bull bar and the winch, and a snorkel and then the 2 inch lift we want and a few other little odds and sods. I had already added it up in my head, I knew it was going to cost a small fortune and I had worded Wayne up that I was going to haggle my heart out, just so he wouldn't be caught out when I started. When we saw the quote I did almost swallow my tongue - it was huge! Then I gathered my wits and the fun began. We both bantered back and forward, back and forward with the fellow serving us and his fellow co-workers, swapped horror stories of being bogged, caught in huge ruts, finding the steepest tracks and they thought they were winning. Then I brought out the big guns: I told them the story of our honeymoon and I could see them caving after just a couple of sentences. By the end of the story they were ready to deal. And deal we did. We saved $946 on a $6,230 sale just for asking a few questions and having a chat, a very enjoyable chat it was too. This is my strategy for haggling. I've used it over and over and it really works. If you've never haggled, don't be afraid, you are just asking a question and the very worst thing that can happen is that the answer is no. Firstly, be prepared to haggle. Start a conversation; build a rapport with the seller. Show you are serious about getting a deal. Let the seller know that you are not just wasting time, but really interested in buying. If you are a regular customer, let them know. Stores want and need repeat business and to keep their customers happy, giving you more bargaining power. Most importantly don't be a time waster, be prepared to buy if the seller meets your price. Make sure it’s worth everyone’s effort. The bigger the ticket price, the more likely it is negotiable and worth everyone’s time and effort. Find out who has the power to do deals - often it's not the sales clerk you see on the floor. Spending 15 minutes to save $1 on a $10 item isn’t really worth it, for you or for the store. On the other hand, 15 minutes to save $300 on a $1,200 bracelet is. Use your bargaining power. Start with the question "What's your best price?" and then stop talking. Put the onus back on the salesperson to do what he must to make the sale. Flash cash. If you are paying cash ask how much for cash and wait for the response. Then ask for seniors discount if it applies, or if they would throw in delivery, installation, etc. Collect prices. Always get the price written on the back of a business card. It helps if you can pull out a written price from another store when you are haggling for a better deal and you'll know exactly which salesperson to go back to when you buy. Be prepared to walk away. The worst thing that can happen is that particular retailer won't discount. All you have to do then is say “thanks for your time” and walk away. Haggling, negotiating, bargaining - call it what you like - is something anyone can do and with a little practice you can become an expert haggler.